Download Windows Vista Ultimate 64-bit ISO Image for free. Home / Microsoft Windows / Download Windows Vista Ultimate 64-bit ISO Image for free. 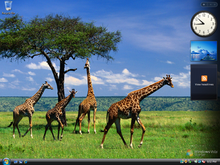 Windows Vista Ultimate iso combines all the features of the Home Premium and Enterprise edition. Microsoft released two notable variant versions of Windows Vista Ultimate: Windows Vista Ultimate Upgrade Limited Numbered Signature Edition, and Windows Vista Red. If you have any problem with the installation or downloading of files or if the links are not working, then feel free to email me: [email protected]. Creating a Bootable ISO Image. 1) Download a .iso image creating software, like ImgBurn. 2) Install and imgburn and after running it select option "Create Image file from files/folders". 5) Now change the Developer ID: Microsoft Corporation, load segment: 07C0 and Sectors to load: 4. 6) In the Boot Image option, Select the browse folder button and then navigate to your Vista folder then the boot folder then select etfsboot.